Good news! You can receive money from an insurance company for dental implants. However, there's a bit more to the story. As Aon Hewitt benefits consultant MacKenzie Lucas says, implants are rarely covered by insurance. So what gives? 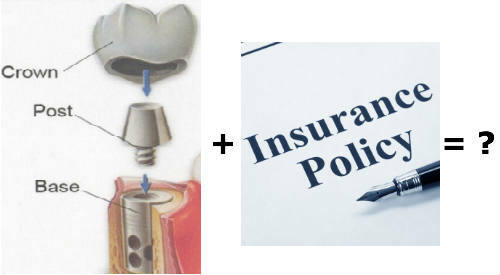 Do dental implant insurance policies exist? Does insurance cover implants? A typical dental insurance policy protects you by covering the cost of replacing missing teeth. This is what implants do. But, the insurance company would pay for the least expensive option that gets the job done, like a bridge or dentures; but not implants. In the real world, this means an experienced implant specialist could get you money from the insurance company, but it would only be enough to cover the lower rate for dentures or a dental bridge. You'll get some money, not all. And you'd still need to pay the balance out of pocket. Since this is the reality for most, look through this article and discover some options to either get you money for your implants or reduce some of the costs. 1 - Shop around and negotiate with the dentist. With or without insurance, you'll pay a big part of this procedure on your own. Get a second and third opinion, and more if needed. What you'll find is there may be different treatment plans available to solve your problem, and each plan will have a different cost. 2 - If you have a dentist lined up, ask for insurance or dental discount plan recommendations; the ones he or she accepts and likes. This could help you zero in on a couple of options and save some time. Also, ask your dentist for an estimate early on. Periodontist Dr. Jonathan Ross says dentists who have the ability to enter electronic claims can often get a quick estimate of dental insurance benefits so the patient has a better idea of what the out of pocket costs will be. 3 - Individual dental insurance. A few things to keep in mind about dental insurance policies. Many of them contain yearly benefit limits of $1,000 to $2,000, but one implant could cost $3,000 or more. Something many people do is straddle two calendar years by scheduling their treatment at the end of the year (and benefit from two yearly maximums back to back). Another issue to beware with dental insurance is that you often have to complete long waiting periods (months, maybe a year or longer) before being able to take advantage of some of the more pricey benefits, like oral surgery. Keep an eye on this, especially if you're in immediate need. 4 - Dental savings plans. These are NOT insurance (if you want to learn the difference see here). They are simple to understand because they work just like other saving-type membership plans (think: Costco). You pay a yearly fee to join, and the plan offers you pre-negotiated discounts with thousands of dentists in its network. What many people like is that the discounts often extend to services like dental implants, veneers, and other forms of cosmetic dentistry. 5 - Group (company paid) dental insurance. The company you work for may offer a lucrative benefits package that includes dental insurance and coverage for implants. Ask your HR department for specifics. 6 - Flexible Spending Account (FSA). In simple terms, an FSA is an investment account (like an IRA) but used for health related bills. If your employer has an FSA set up, you could save money tax-advantaged, which would help cover your dental implant procedure. This would save you money on the total out of pocket costs. However, like all tax programs, it comes with strings attached. So ask your HR department to discuss some of the important details (such as the "use it or lose it" rule, or maximum spending limits due to Obamacare). 7 - Visit a Dental School. Not everyone feels comfortable going this route. But it is an option. A friend chose this option because all the quotes from local dentists came out to as much as a high-end European sedan. Most oral-surgery programs use advanced students to do implants under close supervision (they're already doctors in most cases, but completing extra schooling to qualify for their specialty). Instead of paying the equivalent of a high-end European sedan, my friend ended up paying the equivalent of an American family sedan. 8 - Go overseas. Many people suggest this, and medical tourism is a stable industry. I even know someone who was short on cash and lived near the Mexican border and drove to see his dentist on the weekend to get new crowns and fillings replaced. But these are relatively minor procedures that take less than half a day to complete in most cases. If you're looking into implants, especially for major health reasons like tooth and/or bone loss, you'll probably need many office visits and surgeries and you want to be close to your dentist in case you have complications... I'd be cautious about medical tourism. It may not be practical or convenient in a case like this, unless you live very close to the boarder or really love to fly and deal with airports, immigration, customs, and getting frisked. 9 - Pay cash. Not the most popular suggestion. But for those who can, there is pride in spending. Plus, paying in cash saves the dentist and her staff time and hassle from dealing with insurance company bureaucracy. Also, insurance companies make the dentist wait weeks or months before paying its bills. Paying cash can take away a lot of this stress and headache. In addition, paying cash means you and the dentist don't have to satisfy any lengthy waiting periods, which only delays the dental care you need and want. Cash today is worth more than cash promised tomorrow. 10 - Use credit. Many dental offices have a relationship with a health financing company such as Care Credit. If you're approved, the company lends you the money to get your implants. However, if you're going to use debt for your procedure, don't forget about your own credit card. If it pays points you can redeem into cash, 1ne, two, or three percent adds up fast on something like implants. 11 - Self-finance. If you have life insurance that builds cash value, you can self-finance your implant procedure. When you borrow against your life insurance policy you get the money without any credit check, no job history, and you dictate the payback terms. Ask your agent for details. 12 - A layaway plan - Don't laugh. After the 2008 financial fiasco and real estate bubble burst, many people started to shy away from credit and debt. They discovered the ugly side of it, you have to pay it back, no matter what. As a consequence, layaway plans have started to make a comeback, albeit small and quiet. But if you have a good relationship with your dentist, he or she may be interested (cash collected today is worth more than cash promised tomorrow). If you work out the numbers, it's possible that a layaway type agreement would be a better alternative than paying for a year's worth of insurance premium with a $1,000 spending cap, and sitting through a multiple-month waiting period. As you can see from above, even though implant insurance may not exist in real life, you still have many, many options to save money on your treatment. Purchasing dental insurance can still help you cover some of the costs associated with implant surgery. While a dental discount plan can quickly earn you meaningful discounts on your treatment.